The Marlink Group is proud to launch the Telemar newly redesigned website at www.telemargroup.com. It strengthens Telemar’s position and brand identity as a worldwide leader in bridge electronics, navigation equipment and maintenance for the maritime market. 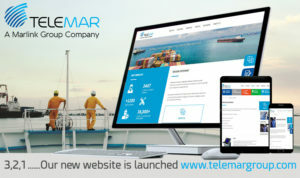 The new www.telemargroup.com domain is a comprehensive website focusing on the Telemar core competencies and capabilities: navigation and bridge electronics, communication and satcom equipment, onboard services and maintenance contracts, and Marlink airtime solutions. Users can navigate our new website with any type of devices (computer, smartphones, tablets) and easily find the information required, whether it is specific equipment, our service competencies or local office and local customer support details. The design has been overhauled to make it more fresh, easy to use and responsive, and consistent with the Marlink Group Identity.